Flipper rebuild kit for Chicago Coin Machine & Stern Electronics, Inc. This is a new, assembled left side flipper assembly. 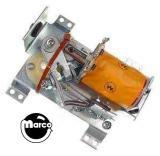 Includes FL-11630 coil.